Used to image the administration, migration, and persistence of transplanted cells. Used to rapidly detect and quantify localized inflammation. Celsense, Inc. offers novel imaging agents used to non-invasively visualize and measure biological processes at the cellular level in humans and other living organisms. The core innovations of the Company involve perfluorocarbon emulsions that can be used to observe cell trafficking using fluorine magnetic resonance imaging (19F MRI) techniques. Multiple application driven formulations are offered in two product families Cell Sense and V-Sense. Cell Sense is primarily used to image the administration, migration, and persistence of transplanted cells. V-Sense is primarily used to image localized inflammation. The Cell Sense and V-Sense formulation names and fill sizes are listed below. Applications for 19F MRI cell tracking include the discovery and development of therapeutic agents (small molecules, recombinant proteins, or therapeutic cells), developing pharmacokinetic data for therapeutic cells in clinical trials, and monitoring delivery of therapeutic cells for approved cell therapies where on target delivery is fundamental to the treatment. The compositions and methods of use for Cell Sense are described in multiple US and International patents, including US 8,417,806, US 8,263,043, US 8,227,610, US 8,449,866. The composition and methods of use for V-Sense are described in multiple US and International patents, including US 9,352,057. The Celsense rainbow logo, “Celsense” and “Voxel Tracker” are registered trademarks of Celsense, Inc.
Cellular therapeutic strategies often include using transplanted cells to reconstitute lesioned tissues or to stimulate an immune response. A challenge in the development and translation of these emerging therapies is effective tracking of cells post-transfer in both animal and human subjects. Cell Sense is a fluorocarbon-based emulsion engineered to safely and efficiently label cells ex vivowithout the use of transfection reagents. Labeled cells are transferred into an animal or human subject enabling investigators to non–invasively track the administration and migration of therapeutic cells, quickly and quantitatively, using 19F magnetic resonance imaging (MRI) or nuclear magnetic resonance spectroscopy (i.e., NMR or MRS). The key advantage of 19F detection is that there is no background signal from the host’s tissues and only labeled cells are detected. Quantification of the 19F signal yields a fast, accurate marker of the number of transferred cells in regions of interest in vivo using MRI, or in intact, excised tissue samples using NMR. Importantly, Cell Sense labeling has no apparent impact on the viability, phenotype, or functional properties of cells. Cell Sense is currently manufactured in the United States under GMP conditions and is suitable for use in preclinical studies and clinical trials under an approved Investigational New Drug (IND) application. A dual–mode version of Cell Sense, detectable using either MRI/NMR or conventional fluorescence detection modalities (e.g., flow cytometry and optical microscopy), is available to simplify validation studies. 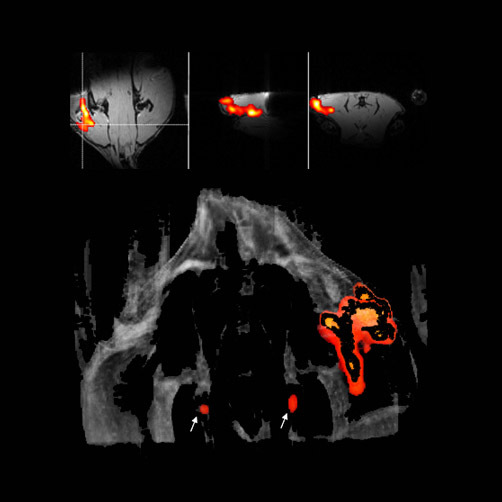 Using the Voxel Tracker software package, investigators can visualize and quantify the number of labeled cells in user–defined regions directly from the in vivo MRI data. Applications of the Cell Sense platform include cell tracking in immunotherapy or regenerative medicine, as well as diagnosis of inflammatory sites by monitoring selected populations of immune cells. Conventional approaches for scoring inflammation in animal tissue, such as histology, often lead to bottlenecks in the discovery and preclinical stages of therapeutic research. V-Sense is an enabling reagent used to accelerate the detection and quantification of inflammation. It can minimize the use of laborious histological processing and yield accurate, fast, and quantitative measures of inflammation in intact tissues or in vivo. V-Sense is a fluorine-based ‘tracer’ agent used in conjunction with nuclear magnetic resonance (NMR) or magnetic resonance imaging (MRI) instrumentation. The heart of V-Sense is a proprietary emulsion containing tiny perfluorocarbon droplets. V-Sense is safe for direct intravenous injection into animals. Following injection, the emulsion droplets are taken up by circulating leukocytes. The fluorine-tagged cells participate in any inflammatory event in vivo. When labeled cells accumulate at a site of inflammation, they become detectable using fluorine-19 (19F) NMR in excised tissue (via biopsy or necropsy) or by in vivo MRI. Quantification of the 19F signal yields a fast, accurate marker of the degree of inflammation present. V-Sense can be used to detect a wide range of lesions and diseases where inflammation is a hallmark, such as in cancer, cardiovascular disease, autoimmune disease, infectious pathogens, and injury. 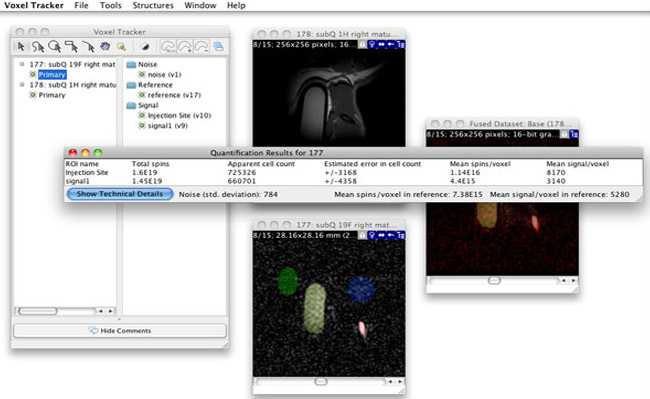 The Voxel Tracker software program maximizes the potential of both the V-Sense and Cell Sense products. It enables rapid visualization and quantification of MRI-labeled cells. The image processing toolbox fuses and visualizes three-dimensional 1H and 19F images. Powerful, built-in, computational tools enable cell or inflammation quantification in regions of interest, thus enriching the utility of in vivo data. The software also serves as a platform for managing workflow and imaging studies. Voxel Tracker is currently offered via convenient web-based access and as workstation software that runs on multiple platforms. For more information and for a demo contact info@celsense.com. Voxel Tracker workstation fuses and visualizes 19F/1H images, quantitatively analyzes apparent cell numbers in regions of interest, and manages imaging studies. Celsense offers products that enable real-time MRI detection of inflammation and cellular therapeutics. The mission of the company is to be the standard for cellular imaging in human health. © 2018 Celsense, Inc. All rights reserved.